Alhamdulillaah, this is the word work for surah Al-Kafiroon. In the workbook for surah Al-Kafiroon, children are introduced to begin identifying letters as they are represented in the beginning, middle and end of a word. In the word work packet there is a word hunt, a movable Arabic alphabet activity that has two flashcards with words children are invited to spell using the movable alphabet, Arabic handwriting practice and more alhamdulillaah! Да вознаградит тебя АЛЛАХ. Большое спасибо. wow ummAysha, you speak Russian subhanAllah. I have been trying to teach Russian more constructively to my kids inshaAllah. Would love to get some ideas of you. These are really nice, masha'Allah. Would you please explain how you created the tracing sheets? I want to create tracing exercises for the ayat that my children are learning, insha'Allah. Which font/s did you use? And is there a template available for the 'lined' paper? Jazaaki Allahu alf alf khaira. Jazakillaahu khayr for your comment dear sis. I am not aware of any template for "lined" paper for writing in Arabic. Perhaps if you can get hold of a handwriting textbook from overseas you can see the design and duplicate it in Word insha'Allaah. The font is called Abu Sulaiman. 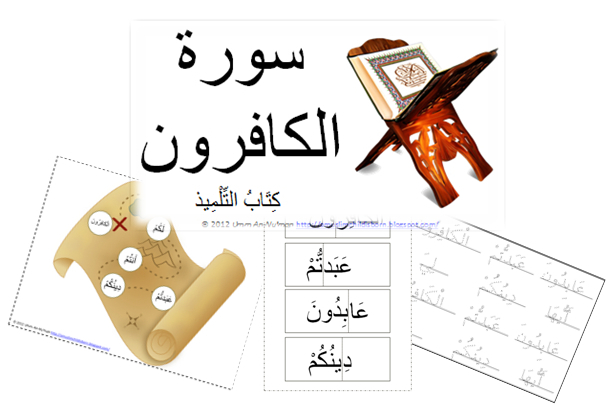 To do the worksheets you just need to use an Arabic keyboard or maybe you can visit a website that has Quraan and copy/paste the text into Word or whichever program you will use to make the worksheets. Insha'Allaah that was helpful to you and will assist you in making your worksheets. These are wonderful. JazakiAllah khair! How can I put Arabic keyboard on my computer (Mac iOS) and do you have surah AshShams?